The original radioenzymic assay used for the determination of octopamine is based on the #-methylation of the /9-hydoxylated amines (such as octopamine and phenylethanolamine to their N-methyl derivatives) by the enzyme phenylethanolamine-N-methyltransferase (PNMT), using radioactively labeled S-adenosylmethionine as a methyl donor in the reaction mixture (Figure 2) . In this assay, labeled methyl derivative of octopamine (N-methyloctopamine, synephrine) is extracted in a mixture of toluene-isoamyl alcohol (3:2, v/v), whereas labeled methyl derivative of phenylethanolamine (N-methyl phenylethanolamine) is extracted into 3% isoamyl alcohol in toluene. After extraction, radioactive samples are quantified using liquid scintillation counter and identified by thin layer chromatography on chromagram sheets of silica gel, using solvent containing butanol saturated with 1N HCl and a mixture of isopropyl alcohol-ammonium hydroxide-water (80:10:19, v/v). The sheets are developed, stained, and the radioactivity is determined in the marked sections. The LOD for octopamine by this procedure is 0.05 ng of octopamine per 0.5 ml sample volume (6.53 pM) . Some investigators have expressed doubts about the specificity of extraction procedures used in the original assay [35,47], whilst others have shown concerns because original assay does not allow the simultaneous determination of m- and p- isomers of octopamine . Therefore, additional modifications such as further purification of co-crystallization from methanol solution by adding ethyl acetate after enzymic methylation of octopamine and selective isolation of labeled synephrine using unlabeled synephrine as a carrier have been made in this assay . The radioactivity is determined by liquid scintillation counting, and the identity of radioactive product is checked by chromatography of the thrice crystallized product on TLC plates of silica gel using three solvents: (1) n-butanol saturated with 1M HCl, (2) isopropanol-ammonia-water (80:19:10, v/v), and (3) n-butanol-acetic acid-water (4:1:1, v/v) . The advantage of crystallization is to avoid high and erratic radioactivity values that have been observed in the hemolymph of the locusts Schistocerca americana gregaria in the absence of this step . Other modification accounts for improving the sensitivity of the assay as well as allowing simultaneous determination of m- and p-octopamine isomers and phenylethanolamines that are found in rat salivary glands . The modifications such as dansylation of amines after stopping the enzymic reaction, extraction of these amines in benzene, and purification by TLC gel plates using three solvent systems: (1) chloroform-butylacetate (5:2, v/v), (2) toluene-triethylamine-methanol (10:1:0.5, v/v), and (3) ethylacetate-cyclohexane (35:25, v/v) give reproducible results in a variety of insect tissues [48,50]. The disadvantage of original assay is its nonspecificity. PNMT can accept all three isomers of octopamine as substrates, but all isomers are identified and quantitated as p-octopamine. Furthermore, presence of other alternative substrates (such as norepinephrine, normetanephrine, and phenylethaolamine) in tissues may result in lack of specificity (Table 1). In addition, the solvent extraction using n-butanol saturated with 1 M HCl or acetone 35% aqueous ammonia, 99:1 (v/v) gives poor results. Saavedra's modified assay gives LOD for octopamine as low as 50 pg (0.0003265 pmol) and allows simultaneous determination of phenylethanolamine in the same tissue sample . Figure. 2. Biosynthesis of catecholamines: (A) in vertebrates and (B) in invertebrates. TH, Tyramine hydroxylase; DDC, Dopamine decarboxylase; DBH, Dopamine-p-hydroxylase; PNMT, Phenyl-ethanolamine-N-methyltransferase; AAAD, Aromatic amino acid decarboxylase; TDC, Tyramine decarboxylase; TBH, Tyramine-p-hydroxylase. 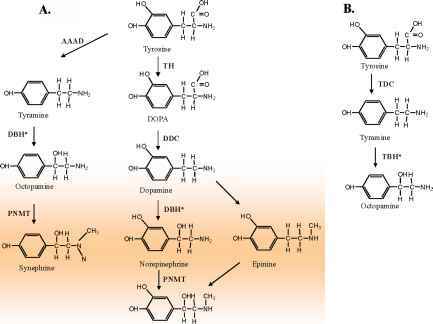 *Both enzymes DBH and TBH recognize either tyramine or dopamine as substrates but have different affinities. Both enzymes have similar properties, and catalyze the hydroxylation step, suggesting that they are functionally homologous . Epinephrine labeled methyl derivative of octopamine, but without incorporation of rigourous chromatographic purification step it results in artificially high amine levels (Table 1). Gas chromatography-mass spectroscopy (GC-MS); high-performance liquid chromatography coupled to electrochemical detection (HPLC-ECD); high-performance liquid chromatography florometric detection (HPLC-MCD); borate micellar electrokinetic capillary chromatography (Borate ME-KCEC); capillary electrophoresis (CE); capillary electrophoresis optical fiber LED-induced fluorescence detection (LED-IF); Naphthalene-2,3-dicarboxaldehyde (NDA); gas chromatography (GC); capillary gas chromatography with electron capture detector (GC-ECD); pentafluoropropionic anhydride (PFPA); electroosmotic flow (EOF). 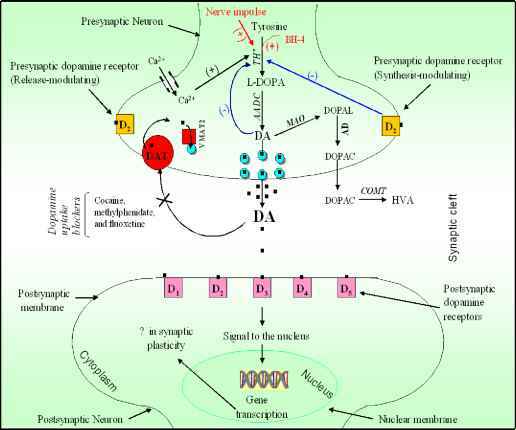 Another radioenzymic assay is based on determination of dopamine-p-hydroxylase (DBH) activity in vertebrates, and tyramine-P-hydroxylase (TBH) in invertebrates. Both enzymes are functionally homologous. They require O2 and ascorbic acid as cosubstrates, bind copper, and catalyze the p-hydroxylation reaction. DBH uses a phenyl-substituted alkylamine (dopamine or tyramine) as a substrate (Figure 2). DBH activity has been detected by converting [I4C]tyramine to [I4C]octopamine, oxidizing with periodate to form [I4C]p-hydroxybenzaldehyde, separating by solvent extraction into ether, and then counting the radioactivity . It is necessary to inactivate potent endogenous inhibitors of DBH that are present in the tissue homogenates. Otherwise, these inhibitors interact with the copper (Cu2+) present in DBH [57-58]. DBH assay allows LOD as low as 7.5 pmol of the product , whereas using radioactively labeled S-adenosylmethionine, Henry et al. have reported the LOD value of 33 pmol. The further modified radioenzymic two dimensional TLC-based assay uses purified PNMT with optimal incubation conditions . DBH catalyzes the hydroxylation of p-tyramine to form p-octopamine, which is then methylated to synephrine by PNMT using [3H]S-adenosylmethionine as the methyl donor (Figure 2). This assay simultaneously detects as low as 2 pg of p-octopamine and p-tyramine. It allows less than 0.2% contamination from other structurally similar amines, suggesting improved specificity for p-octopamine and p-tyramine . TBH assay relies on the conversion of radioactive tyramine to octopamine (Figure 2), which is then methylated to synephrine by PNMT . Collectively, the sensitivity of radioenzymic assays varies depending on the buffer, sample type (source, tissue, biological fluid), maximal concentration of substrate, and enzyme level in the reaction mixture.